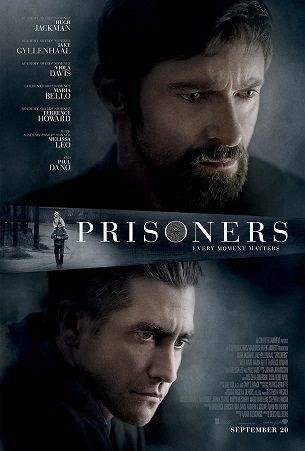 This thread is being set up to give you a place to discuss Prisoners. Please note that spoilers are welcome to be discussed here, so if you have not seen the movie, and don't want anything spoiled, don't read any further. Sonja, hope to see you asking your questions in the discussion thread I set up! Well, I'm here... but where is everybody else? I can't believe I'm the only one on here who saw it and thought Jake was astonishing in his role of Det. David Loki. The rest of the cast was fabulous too. Yes, the movie was dark, some people might say disturbing - but the acting and photography were brilliant! Anyone else who would like to discuss it? I'm here. I think that he will know or figure out it must be Jackman's character. Because he saw that the little girl had a whistle around her neck, and he asked about it, and the mother told him it was new. I like the ending. I mean it's pretty obvious that David is going to find Keller. The real question is what will become of Keller. Instead of wrapping that up in a neat package, the film allows the viewer to ponder what, if any, societal price he should pay for his actions. I certainly hope he'll find Keller! All in all I thought Keller was not very likeable, and yet I felt sorry for him... I felt sorry for all of them - Anna's parents, Joy's parents, even Loki and Alex (or whatever his name was in the end - I can't remember). I don't have kids myself and I don't think I can ever fully understand what it feels like to be in a situation like that (missing children), but I nearly cried at some scenes, especially Maria Bello's character's emotional scenes. In the end, when she's in the hospital with Anna, having the conversation with Loki, all I could think was: "I hope she'll be happy - but what if they can't find her husband?" It's weird, it's the emotions that stand out for me in this film - not the violence or the torture. Because he saw that the little girl had a while around her neck, and he asked about it, and the mother told him it was new. I agree with Ellen, I think that Loki would realize the whistle would lead him to Dover. One thing I was unclear about was how long he was down in the hole under that car. When she (Holly Jones) shot Dover, she made a comment about wanting him to survive long enough for her to put his daughter in the hole with him. However, when Loki is reading the paper, the pic of Dover had the headline "Local Man Still Missing", so how many days was he down there? I like the ending. I mean it's pretty obvious that David is going to find Keller. The real question is what will become of Keller. Instead of wrapping that up in a neat package, the film allows the viewer to ponder what, if any, societal price he should pay for his actions. I looked at the ending realistically, as strange as that is to do with a movie that is a fictional piece. I assumed that Dover would get a lawyer who would talk about Dover having "post traumatic stress" with the loss of his daughter, the fact that Alex Jones did actually know where the girls were, and that his family had been doing this for years, and the fact that Dover is a family man with no prior record, owns a business, and is a church-goer (assumed, but Dover made numerous references to God and prayer), and I'm thinking he'd get probation. This was a conversation we had after seeing the movie.....I'm not a parent either, and like you, won't ever understand what it is to be in a situation like that, but there were times watching the movie I was wondering if I would be able to do what Hugh Jackman did. I completely missed the whole point of Bob Taylor in the movie the first time (the guy who was captured and drawing the maze in the station, he had all the cartons of the kids clothes and snakes). Also: did Bob really kill himself or did Loki accidentally shoot him? Did the police force try to make it look like suicide to protect Loki? I can explain tonight, when I get home. He sort of looked similar to Alex, didn't he? As for how long it had been since Holly put Hugh Jackman under the car, I thought it was a few days, but not much longer. I think he killed himself. What Loki should not have done was lose his cool and run into the room, make contact with Bob -- allowing him to get hold of the gun. But from what I remember of the scene, Bob was the only one who could have pulled the trigger to kill himself. I sort of remember Loki looking at his own gun, as if to say: "Did this guy just kill himself or did I shoot him?" As for your last question, Bob killed himself. As for him being at the vigil and the clothes, mazes and stuff.....from what I remember (and understood) he was a child abduction victim who got away, apparently from the aunt and uncle. The body that was found in the priest's basement was the uncle who had disappeared years ago. His necklace had a 'maze' pendant on it, which is why Bob was obsessed with mazes and kidnapped children. The clothes he had didn't belong to any kids, they were new, except what he took from the families' houses. He was drawn to the vigil because of his obsession. He was truly an innocent victim in all this.